"Back in Camp Shelby, before we shipped out, Lieutenant Ware was told that intelligence was doing a lousy job. He figured if he filled the squad with intelligent soldiers, he'd get better intelligence. So he searched the regimental records for the soldiers with the highest scores on the intelligence test and requisitioned us as a squad. Of course, six of us are dead. So, what's intelligence?" Very few films are able to grab my undivided attention within the first 30 seconds. A Midnight Clear is a rare exception. The opening moment of a tormented soldier's scream is polarizing in both its horror and eccentricity. I was completely unaware of the reasons behind this character's pain, but the scene is shot and edited in a way that had me intrigued with discovering the answer. The ability to transport a viewer into the heart of a film right from the start is a sign of a great piece of work. A Midnight Clear does not consistently maintain this level of intensity, but it does prove to be intoxicating from beginning to end. Writer/director Keith Gordon has adapted William Wharton's autobiographical World War II novel with majestic results. The story focuses on an American patrol unit comprised of highly intelligent young soldiers who are ordered to scout out the Ardennes Forest in 1944 Germany. These weary and disillusioned men begin to experience strange occurrences amongst the bleak and icy terrain, mostly in the form of cryptic messages that have ostensibly been left by the German army. The unit's first encounter with the Germans is incredibly sinister. As they lie vulnerable in a darkened foxhole, the soldiers listen to menacing whispers and cackling laughs from the surrounding army, yet they are never able to catch a glimpse of their opponents. Another unsettling moment comes when three members of the unit find themselves in the sights of a trio of Germans who could kill them at the drop of a hat, yet merely frighten them before vanishing without a trace. Though the German army is consistently toying with the unit, they are apparently trying to avoid a fight. 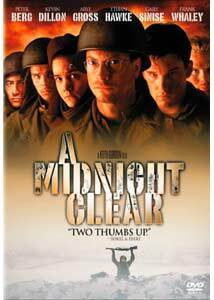 A Midnight Clear is a refreshing departure from the typical war film. It sacrifices extreme violence for a deeper focus on the innocence of its characters, which goes quite a long way in allowing the audience to understand their dire situation. Much of the film shows the quiet, meditative side of war in lieu of deafening explosions. Similar to Terrence Malick's The Thin Red Line, we often hear a soldier's inner poetic thoughts: "I'm having my usual trouble, noticing how beautiful the world is just when I might be leaving it." The entire film does not revolve around pensive dialogue, however. The soldiers' noble intentions of peace inevitably result in violence. In one of the most unique combat moments I have witnessed on film, the audience is given a completely new spin on the typical good versus evil routine. The beauty of the film is exemplified through tour-de-force performances. There are no real standouts, simply because every character is as strong as the next. The casting of actors who predominately look like children was truly inspired. The nature in which their young faces shine in contrast to their tattered war attire makes them look completely innocent. A brief backstory is also utilized to further heighten the sense of the boys' inexperience. This subtle device makes it especially harrowing when these young and na�ve men later go through hell. Keith Gordon enjoyed mild success as an actor in the late 1970s and early 1980s. A Midnight Clear is his second directorial effort, and it proves that his talent truly belongs behind the camera. Though he does not yet show the visual flair displayed by his idol, Stanley Kubrick, Gordon proves he has an inherent knack for filmmaking. Every shot is mesmerizing, yet not too ostentatious as to distract attention from the story. A Midnight Clear is an admirable approach to a genre that often disregards subtlety. Like the best war films, it successfully shows the withering effects of war, and it does so with an eerie stillness. Image Transfer Review: A Midnight Clear is presented in a non-theatrical aspect ratio of 1.33:1. Although the transfer is open-matte, the lack of the original widescreen version is a major disappointment. The full-frame image feels constricted and claustrophobic. The picture would have looked much more natural had it been preserved in its original aspect ratio of 1.85:1. The print suffers from an abundance of film blemishes and artifacts. Color is intentionally muted, with the exception of the flashback sequence, which becomes increasingly more vibrant to convey a lighter and more colorful time in the soldier's lives. The picture often appears soft and, at times, lacks detail. Overall, it does not look as if the print has been cleaned up a great deal, but the muted and raw characteristic tastefully adds to the experience. With the exception of the framing irritation, the visual aesthetic is appropriately gritty. Audio Transfer Review: For Dolby Surround, I was quite impressed with the presence and depth of the soundtrack. Surround use is impressively strong throughout. The howl of the wind flows intensely through the rear speakers, adding a suspenseful chill. Dialogue occasionally sounds a tad strident, yet predominately strong and natural; Ethan Hawke's narration particularly exudes a soothing sense of tranquility. Deep bass is unsurprisingly absent, even for the few explosions, but the presence of low end is strong enough to give the soundtrack a depth that does not distract the viewer. While it does not have anywhere near the dynamic range of a 5.1 track, the Dolby Surround track is quite suitable for this film. Extras Review: The feature-length commentary by Keith Gordon and Ethan Hawke contains a wealth of interesting information. Gordon speaks professionally though humbly; he never forgets to give due praise to Wharton's novel. His intelligent remarks prove that he is an instinctive filmmaker who understands the process implicitly. Hawke is also quite articulate and impressed me with his knowledge of World War II history. Often their discussions diverge from the film and leans more towards the art of directing and acting, but never do their comments seem extraneous. This is a solid commentary track in all regards. Next is a lengthy section of deleted scenes. I must again express my grave disappointment that the feature film has been altered to full-frame while most of the deleted scenes are presented in nonanamorphic widescreen. Many of the scenes are quite good, and I can now see why it was a struggle for Keith Gordon to cut them. Several backstories flesh out characters in a way I would have liked to have seen in the finished film. Each of the 10 deleted scenes includes an optional commentary from Gordon. His comments are as insightful and intelligent as those heard on the feature-length commentary. Also included is a bonus trailer for Casualties of War. This nearly irrelevant trailer is the only special feature presented in anamorphic widescreen, an element that I find absolutely baffling. I could incessantly complain about the lack of original aspect ratio, but the fact of the matter is, A Midnight Clear is well worth seeing in any format. My already high appreciation for this fully engrossing war film has been heightened further thanks to a captivating commentary track.